For more than 50 years, anyone who was a fan of virtually any sport in the Puget Sound region was familiar with the voice and style of Rod Belcher. 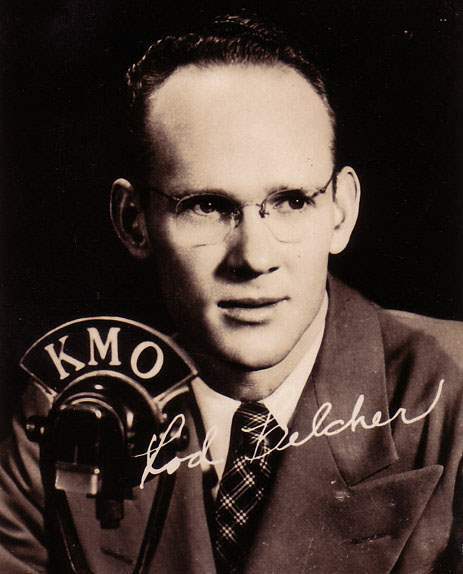 As a television sportscaster, a radio broadcaster and a stadium public-address announcer, Belcher covered virtually every team and every sport during his career from 1946 to 2003. While working for KING-TV and radio, he was named the Washington Sportscaster of the Year three times in a row from 1963 to 1965. At that same time, Keith Jackson, who would go on to a legendary career with ABC-TV, was working at KOMO. Through the years, Belcher did play-by-play for football, basketball, track and swimming for the University of Washington and play-by-play during the great years of Seattle University basketball. He also did Seattle Rainiers baseball and Tacoma Indians football as well as boxing, hockey and football and basketball for high schools and Pacific Lutheran College and the College of Puget Sound. He was the voice of hydroplane racing on Lake Washington for KING-TV from 1960 to 1982. He also handled the aquatics competition in the 1990 Goodwill Games for television. His public address announcing included the Seattle SuperSonics from 1968 to 1970, Washington menâ€™s and womenâ€™s basketball from 1980 to 1988 and national AAU track championships and the Olympic Trials in track in 1972. His final job lasted until 2003 as the press box PA announcer for the Seattle Seahawks, which he handled into his 80s before retiring, fearing his eyes and ears might be failing him. Belcher had a few national stints as well, working the 1964 Rose Bowl telecast with Lindsey Nelson. In 1950, he was the radio voice of the San Francisco 49ers, although with a different name. The 49ers at the time were sponsored by a beer company, which didnâ€™t think the name â€œBelcherâ€� would help sell the product. Rodâ€™s middle name is Hugh, so for that year with the 49ers, he went by Rod Hughes. Belcher had his own athletic career, growing up in California and attending Humboldt State University. He played basketball for the Lumberjacks and was all-conference on their championship team in 1942. His professional life also included a stint as a public affairs officer for the Washington State Department of Transportation. E. Washington vs. Puget Sound Loggers (1949) Second half action of the Eastern Washington vs. College of Puget Sound Loggers in a football game played Oct. 8, 1949 with the Loggers prevailing by a 13-7 score.